There were two stations in Sweden called Black Peter. One from the 50’s and one from the 70’s. In the summer of 1974 Paddy Stevens bought a 110 watts transmitter, but this one were never used because of some broken tubes. The weight was a little bit to high as well, 65-70 kilos. 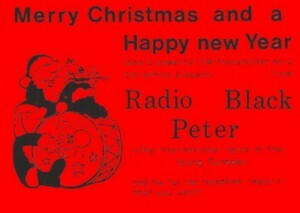 He sold the tx to another Swedish station, Radio Elra. So instead he bought a used transmitter from old west-Germany with an output of 18 watts which was used for the first time the 18’th of October 1974. The equipment beside the transmitter consist of one Telefunken recorder, two smaller tape-recorders, two dynamic microphones and a Japanese 4-channel mixer. The station had a strange QSL-policy, and received some criticism for this. If you brought three IRC’s with your report, you got a “De Luxe”-QSL with printing on both sides. With 2 IRC’s you just received a “common” QSL. This was a little bit too thick. 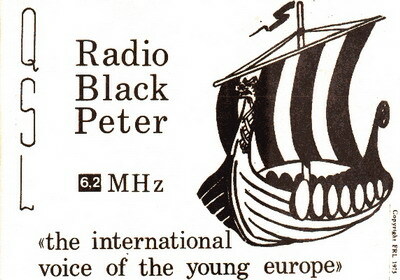 The 23’rd of may 1975, the last transmission from RBP came out on 6225 kHz. According to Paddy Stevens, was it a radioamateur with a mobile radio location set that had been hunting them this day. They manage to escape with the transmitter, but thanks to the fear of getting caught, RBP closed down. In 1976 the station woke up again under the name Radio Snoopy International, but that’s another story.